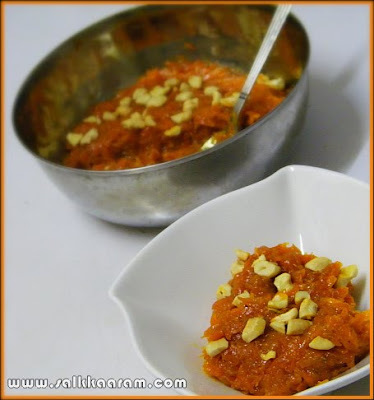 Carrot Pudding / Gajar ka Halwa | Simple and Delicious ! 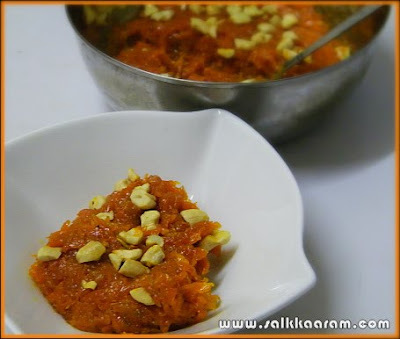 I tried this when my aunty asked for a carrot pudding recipe. She didn't like the very soft one, so I tried to prepare it with some cream, the outcome was not very thick, but was delicious! Heat ghee in a thick bottomed vessel. Fry cashews and keep aside. Put carrots and pour milk into that. Keep stirring on a medium flame until the carrots are cooked. Then put sugar, cardamom and cream and keep stirring. Continue stirring until the mixture starts leaving from the pan and it turns to a ball consistency. Transfer the ingredients into a greased plate, garnish with cashew-nuts. One of my favorite Indian desserts. I've never had it with cashews, but I bet it tastes great. thank u for halwa recepe. i have tasted this from das continental trichur. the hotel belongs to my co-brother. as u said it is more tasteful with vanila ice cream. itz of course very easy method, still our keralite house wifes are not familiar with the preparations. i never thought this was so simple. but here my better half is very adament since few months and i hv to wait till my daughter comes my home. CAN U TELL HOW CAN I GET CREAM?I MEAN IS THERE ANY GUD BRAND NAME?OR CAN I USE RAINBOW CONDENSD MILK INSTEAD OF CREAM? I am drooling all over Seena.. Looks super delicious...It has been ages since I had this one. One of my favorites! Looks so inviting! You can use condensed milk instead, so adjust the sugar amount according to that. I used puk cream.. All the best! All time fav of mine. Love your recipe and it's tempting.